I am nineteen years old and have played go since the beginning of April of 2006. I won the October Iron Man Tournament, kyu handicap division. As I have said above, I study Go very intensly and, probably in a different way then most. Instead of studying games, and problems; I have studied a lot of "Go Theory" and "Mechanics." Here is my list of what I do to study every week. As noted above I have been given a teaching account by KGS. For this reason I try to teach as often as possible, because I have gotten strong fast because of other people teaching me. I currently offer three lectures on a weekly basis. My lectures include mostly fuseki theory, go problems, and creating proper shape. The lectures are designed for any player, but would be most useful for players around the strength of 3d-10kyu. Learning is not possible just from lecture so my lessons are not focused just around my lecture. All questions, and comments will be answered by myself or others. I would like to consider is more of a discussion focused around the lecture. Generally they last from 60-90minutes. These lectures are in text and audio. I also offer teaching games to any who wish to take it. I keep copys of all of my lectures on my computer. If you want a copy just message me in KGS. This is being updated often. 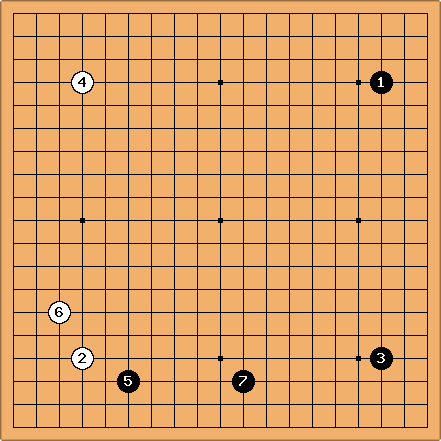 Due to my love of Go Theory I study many different types of Fuseki. My personal theory on Go is to avoid complications, so I tend to stick with the Komoku. Closing the corner later seems ill timed, and many times ruining sente. I will show my current favorite fuseki. I always will play (The Mokuhazushi), because I am not sure if White will play the second Hoshi. If the player then moves at D16 then I will at R4 and close the corner. If the player then moves at D17 then I will approach the Komoku (Being ) and hope to close the corner at R4 later. The reason why I like this opening the most is because I am a very territorial based player, and creating this influence on the right side is important. I have found while reviewing a lot of Shusaku games that he does like this approach. This is because it is a great balence between Attack and Defence. Having this balence throughout the game is of course better then just the standard fuseki. This is also played in a lot of recent pro games by children. I don't see it being played by many 9ps consistantly. Closing the corner is immediate to me, because I try to play very solid. Having a solid shape allows me to play more agressivly in the middle game, and hopefully destroy my oppoent's Overplays. The Influence on the right side is important to me, just due to my style. This still is okay for my balence between Attack and Defence, because if needs to be played on the right side. If not, then at R10 is very large. I'm falling in love with with, but now people know I do it and won't let me :( They now play 2 at the upper komoku, and 4 at the lower komoku. Above the star on the top, and below on the bottom; i mean. My chuban is very weak and I should not comment too much on this, but I would say that you should balance attack and defence. Also, when competing moyos make sure you gain more. Invade before your opponent gets too much, and do it at the last moment. My critique on Yose is mathamatically based. First, play all large double sente. Secondly, Count up all the moves left and calculate into points. You count up the points by how many points you gain + how many they lose. Kind of a total sum formula. Thirdly, If you are going to play a Gote move, count how many points they can gain in sente before you gain it back. If it is more then your gote move, stick with sente and hope you can play the gote after. Fourthly, Resign if you can't win. 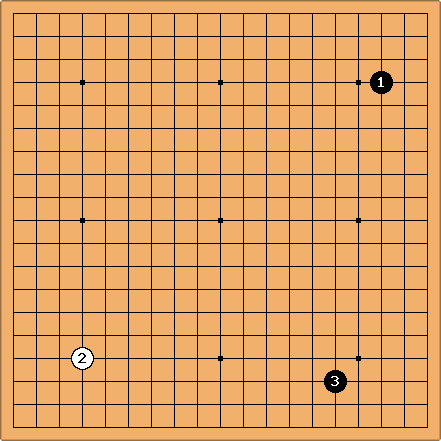 Studying SGF files are okay, but it is better to print out the kifu and place the stones by yourself. Playing them yourself will help you learn faster, and you will feel like you are playing the game, and feel "The Flow of the Stones." Study them together on KGS with others. When more comment you will learn more. This is the best way to test your reading ability. You should study these often to learn new tesuji, and shape based moves. 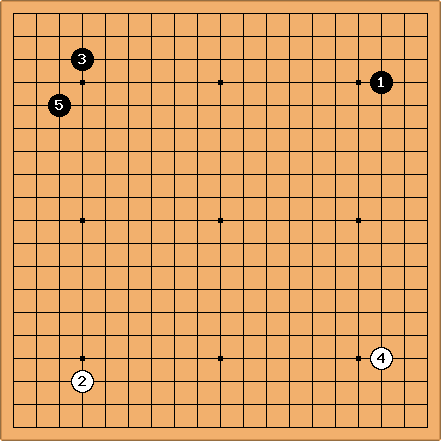 Studying Go problems is a great way to improve your rank very fast. Your Life and Death will improve much faster, and you can learn to fight better. Once again you should study these with others. Aftermath: He has his own teaching account on KGS. TrueOrgan: Mr Shintou is the man! http://senseis.xmp.net/ I have no rank, skill, or style.